Ride in Security like never before…with B.O.S.S. Bob’s Overhead Security System —or B.O.S.S. It’s a new high-tech safety solution that offers a multitude of enhanced safe-riding benefits exclusively for Bob’s customers who enroll in our great program! It turns out that being the most prominent BMW dealership in the Washington DC area’s has its advantages! Imagine the peace of mind you’ll have knowing that our friendly drones are in the air at all times acting on your behalf. Yes, every time you ride, you’ll know that we’ve got your back! By constantly monitoring travel conditions on the ground – to a degree of precision never before thought possible – the B.O.S.S. drone fleet will take the “guesswork” out of motorcycle riding by keeping track of constantly changing traffic and road conditions, as well as alerting you to the exact location of such dangers as severe storms, roads under construction, accidents, official checkpoints, and other police activity. You’ll even know where the potholes are – BEFORE you see them! How does B.O.S.S. work? EASY! If you have had a BMW Nav IV or Garmin GPS unit installed on your bike at Bob’s in the last two years, or even if you bought it from Bob’s and installed it yourself, you are ALREADY “PLUGGED IN” to our surveillance system! 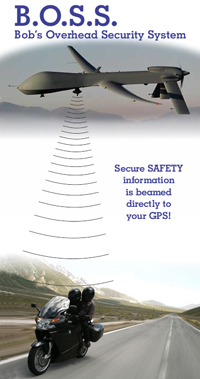 That’s right, our Eyes in the Sky already know where you are – and WHO you are! But whether you have a GPS now or are planning on buying one soon, you’ll need to enroll in our program in order to actually utilize the benefits of this technology. Because when you’re a member of our Early Warning Safety Program, all the specific information you need to ride safely in today’s increasingly hostile traffic environment is delivered right to your on-board GPS unit – in real time as you ride! How much, you ask? You’ll be AMAZED to learn that membership in Bob’s Overhead Security System is completely affordable. Now you, as a Bob’s BMW Rider, can travel anywhere in these United States knowing that B.O.S.S. technology is at work to guarantee your Riding Pleasure!